Our septic services in Odessa, FL aim to keep your septic system healthy and fully functioning for many years. 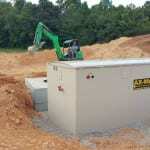 Septic services are not limited to the major reasons people need professional help with their septic systems. Beyond standard cleaning and emptying, there are a number of septic services that aim to keep your septic system healthy and fully functioning for many years. Our team at Southern Water and Soil is here to help all of our customers with a variety of septic services, including permitting, repair, and the full spectrum of installation and maintenance needed to keep your system functioning at its best. If your location has never had a septic system, or if you are planning changes or expansion of an existing system, you will need to know the local, state, and federal regulations regarding septic systems. Various rules exist in certain areas in order to protect groundwater resources, preserve soil integrity, and ensure that septic systems conform to standards of hygiene and public health. Working with someone who already knows the permitting process will greatly speed up the approval of your permit application, avoiding potential issues in the design and implementation of a septic system that could require a redesign of the entire setup or a flat-out rejection of the application. Knowing the types and options available to your area allows you to customize your septic system to your needs, ensuring that you will have a worry-free setup that will be reliable for many years. If you do have any problems that arise, your first call will be to a company you can trust to do the best work in the least amount of time for the best price. At Southern Water and Soil, we have years of experience in the Odessa, Florida area, the best products for your septic system, and the commitment to all of our customers with our septic services. At Southern Water and Soil, we offer septic services in Tampa, Odessa, Lutz, Land O’ Lakes, Brandon, Orlando, Plant City, Dade City, Bartow, Lake Wales, and Lakeland, Florida.